This post was preceded by “C Plath Yachting sextant“ “Making a shades adjusting tool” and “Eighty years of Carl Plath Sextants”. Other posts on C Plath sextants may be found by entering “C Plath” in the search box on the right. C Plath bought the business of David Filby, Hamburg’s member of Parliament, in 1862 and shortly after he disposed of the book and chart side of the business while retaining the nautical instrument side. Around about the time that he moved into the address known as Stubbenhuk 25, he acquired a dividing machine from Repsold, his former apprentice master, and began to make his own instruments, including sextants. A year or so ago I acquired an early C Plath sextant for a very modest sum on e-bay. It and its case were not in good condition and so I restored them, but other commitments have until now prevented me from writing about it. Figure 1 shows the case as received, with shrinkage cracks in the top and signs of water damage. Much of the varnish had crumbled, so I stripped off all the old varnish from the outside, filled cracks, made good loose joints, re-lacquered the hardware, re-stained the mahogany and applied several coats of modern varnish to give the result shown in Figure 2. The corner joints are rebate joints, reinforced with steel pins at a time when most makers were using hand-cut corner dovetails. The top, however, is attached with brass screws, while the bottom is glued and pinned on, following the practice of nearly every maker throughout history. The pins tend to rust, being “out of sight, out of mind”. The interior as received is shown in Figure 3. Apart from dust and many flakes of paint the green felt lining of the floor and roof of the box had decayed. Fortunately for the instrument, the pocket for the handle and the pads for the legs were attached by screws and glue which had not given way. Cleaning the interior and fitting new felt completed the restoration of the case, and restoring the instrument itself presented few problems as everything was present and intact. Figure 4 shows the back of the frame, which is a heavily ridged bronze casting. In the nineteenth and early twentieth century, a very large range of frame patterns was offered by the major makers, but it was not until the early part of the twentieth century that Plath left behind this initial pattern in favour of the ladder pattern, with the occasional three circle or “Dreikreis” pattern being offered (see my post for January 2010). Note the heavy re-inforcement in the areas where the telescope and horizon mirror brackets are mounted. Figure 4: Frame before re-painting. The traces of paint that remained were a pale green, but the sextant illustrated on page 50 of Friedrich Jerchow’s history of C Plath, From Sextant to Satellite Navigation, is painted black, so I surmise that the green represents perhaps a primer coat. At any event, I stripped it all off and re-coated the parts black, taking the illustration as a pattern. Figure 5 shows the sextant in its case after restoration. Figure 6 shows the kit of telescopes and other parts supplied. Well into the twentieth century, sextants were often supplied with several telescopes and supplementary eye-pieces. I doubt that there was ever a time when most of them were used at sea. The 6 x 16 Galilean telescope has a tiny field of view and the 10 x 17 inverting telescope is no better. There may have been a time when they were used on land with an artificial horizon to check on the rate of chronometers in distant ports of known longitude, but at sea the 3 x 28 Galilean was probably the one used most, with the ‘zero magnification” sighting tube being substituted in rough weather. The eyepiece shade may have been used to check index error using the sun, but again, most people would probably have used the horizon, as it is easier on the neck to do so. The shades and mirror brackets are perfectly conventional and avoid the complications used by French makers in particular and also by Brandis and successors. The tangent screw is of some interest and is shown complete in Figure 7. 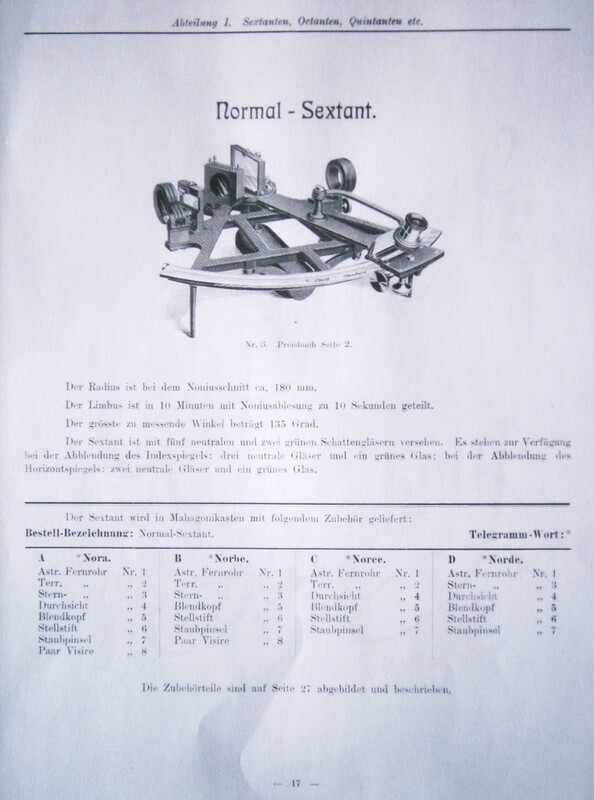 With slight modification it was also used in the Dreikreis sextant before the micrometer sextant was developed by C Plath around about 1907. The spring box, which I have called a “sliding block” in different designs, slides in a close-fitting pocket on the rear of the index arm expansion and can be clamped to the limb using the clamp. A leaf spring keeps the box in place when un-clamped. The end of the tangent screw bears on a tongue projecting from the back of the index arm against the pressure of a coil spring within the spring box. thus, as the screw is turned, the index arm moves along the arc in slow motion. On releasing the clamp, the index arm can be swung rapidly by hand. Figure 8, which shows the mechanism exploded, may help to make this clearer. Figure 8: Tangent screw mechanism exploded. The mechanism for raising and lowering the axis of the telescope so that more or less light from the horizon can enter it is shown in Figure 9. It represents an intermediate stage of complexity on its way to the simplicity of the second half of the twentieth century. Figure 9: Telescope rise and fall. A telescope bracket having a vee groove and flat machined into it is attached to the frame of the sextant. The rising piece of the telescope has a matching vee and flat to guide it up and down. The lower end of the rising piece has a threaded hole for a screw that is held captive in the telescope bracket, to that when the screw is rotated, the rising piece rises or descends. A clamp holds the rising piece at the selected height. The silver arc, let into the bronze limb, is divided to 10 minutes (Figure 10) and the silver vernier allows readings to ten seconds, though, as with many similar verniers, it is usually impossible to decide which particular pair of lines coincide. It is easier to decide which two pairs of lines just do not coincide and to choose the middle value between them. It bears the C Plath name in flowing copper plate script, a feature of Plath’s earlier sextants. Figure 11: Serial number and inspection mark. Dr Andreas Philipp has kindly provided me with the date of early 1899 for the instrument, or at least, its certification by Deutsche Seewarte. He tells me that both “S” and “D S” were used irrespective of date. He also sent me an illustration from Plath’s number V catalogue of 1906, which I reproduce below (click on this image to enlarge it). Based on the D.S. records, it seems that between 1876 and 1901, Plath produced an average of only 27 sextants per year. Thank you Bill for this most interesting story. This venerable sextant looks now as it probably was around 1900. You were very lucky to be able to put a hand on this instrument and its case which were rather well preserved. Marvelous, as always! The name Repsold popped out at me, as I’ve been delving into the world of gravity pendulums, and there’s one very successful one that’s his. He in turn had been associated with Bessel, which is about as good as it gets. “Spring box” —I like that.Makes me think of antelopes.Great stuff, thanks.